There are countless examples of generic computer hardware from practically every era of personal computing. Here's one now. As usual, there is very little information to be found by any popular search engine. What you're looking at in the picture above is a particularly generic EGA display adapter card. Apart from the EG-3000 text printed on the option ROM IC, there's very little by which this adapter could be identified. An easily overlooked clear plastic sticker on the back gives an FCC ID of E5Y-EG-3000A (belonging to DFI Corporation and issued June 22nd, 1989). This card also shows up with many other names on it, such as Octek. It really wouldn't be all that interesting were it not for the very curious item at the top left of the card. That's what drove me to write this page. How about a closer look at that item? As with many early video cards, this one has no shortage of oscillators. Each one is responsible for the video modes that the adapter can generate. On the main board itself, there are 24.000, 16.257, and 19.000 MHz oscillators. The curious daughtercard above adds only one thing--a 34.0000 MHz oscillator. You might think that with 32 pins in that connector that perhaps the daughtercard provides more video RAM, but no. Only three pins from that entire connector are used to connect the oscillator with the other circuitry on the card. 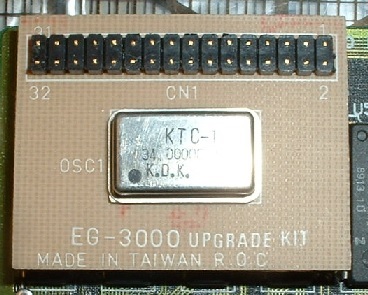 The board is marked only EG-3000 UPGRADE KIT. I'm very curious as to what this "upgrade kit" makes possible. My guess is that it adds an extra display mode or higher resolution to the card's capabilities. 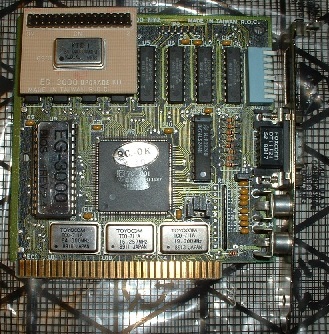 Total Hardware '99 includes this card in its library, but does not expand on exactly what purposes the underlying "feature connector" has. Presumably other functionality is offered, as approximately 11 pins are connected via traces on the board. Although the board can be configured to output CGA video (or, supposedly, monochrome video as well) the oscillators do not match the frequencies needed for CGA or NTSC TV output. This would tend to suggest that the video controller IC has a frequency synthesizer of its own onboard. You can configure the video output characteristics with the onboard jumpers, using the settings as explained by Total Hardware '99. I've not attempted to verify how correct these are. They could be questionable, as the page states the maximum video resolution of this adapter as a very implausible 800x600. The primary video output is via a 9 pin D shell female connector. Two RCA jacks seemingly provide for composite video output. I find it a bit surprising (and doubtful) that two of them are provided for this purpose. Rounding out the user accessible connectors is a probable light pen connection at P2 on the board. It's a little surprising to see this on an EGA display adapter, as I don't recall seeing any others with this feature. It was much more common on CGA display adapters. Finally, there is the video processor IC itself. Unlike many no-name adapters, the video processor has identifiable markings on it. It is labeled as a Gemini VC-001, with copyright and mask rights markings dated 1987. This chip was made in Japan. I didn't find much online about it, apart from a brief mention at a "VGA Legacy" museum page. 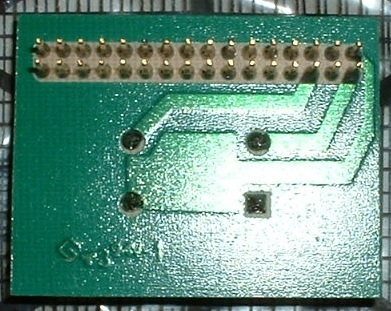 Gemini seemingly also designed a VGA controller IC known as the VC-004. "Gemini" seems to have been more completely known as "Gemini Technology Incorporated". If it's the same company, a LinkedIn page belonging to an Edward Dolejsi suggests that Gemini Technology was a Canadian firm that designed PC emulators, various graphics chipsets, a cable free IBM PC compatible and a laptop with (of all things) a built in telephone. I'd like to contact Mr. Dolejsi to see if I could get more information or confirm that the company he worked for is, or is not, the one I'm looking for. Unfortunately, that does not seem to be possible without signing up for LinkedIn, and I could not find any suitable e-mail address through a web search. In my efforts to find information concerning this adapter, I came across some files said to contain both a ROM dump, as well as utilities and drivers. Though I've not examined these in any great detail, the utilities are fairly well documented and seem to suggest that many aspects of the VC-001's operations can be changed by software while the computer is running a DOS compatible operating system. Also provided with the utilities is a tool to shadow the EGA BIOS in RAM, thus relieving some of the performance penalty caused by directly accessing the ROM. Drivers include the usual suspects, for programs such as AutoCAD. You'll find a complete list of what drivers are provided by browsing the downloaded drivers package, linked below. Disclaimer (as always): I've not used these files myself, or tested them in any way. They are provided ONLY as a public service to owners of hardware based on the Gemini VC-001 video processor IC. It's entirely possible that not all functions are supported with all hardware variations and that attempting to use this software could cause six foot flames (or worse) to shoot out of your computer. You use these files ENTIRELY AT YOUR OWN RISK. If you are not to prepared to assume all of the responsibility for the results of using these files, do NOT download or utilize them. Use of this software on other hardware may be a violation of applicable laws and may in fact damage that hardware or anything attached to it. All of these files are in ZIP format and may be extracted using functionality built into many operating systems, or by popular software utilities such as WinZip or 7-Zip. As always, I'm interested in any comments, questions or further information you can provide. Contact me! Copyright © 2014 William R. Walsh. All Rights Reserved. Permission is granted to reproduce this material or to use any part of it in other creations, so long as the following terms are met: attribution to this page and its author must be supplied, no part of this page may be displayed along advertising content of any sort, no fee may be assessed to provide access to this information (except as reasonably necessary to cover connection time or printing supply expenses) and no part of this material may be used in creations that are illegal, dangerous or derogatory. Created 03/09/2014. Special Thanks to the developers of BlueGriffon for not including font size controls in the editor GUI. (Yes, this HTML was written in a GUI/WYSIWYG editor, and no I do not want to hear the first critical commentary about it.) I am absolutely uninterested in using CSS or delving into the technical problems that brings up for users of older browsers, or browsers with broken CSS implementations. The complexity is unwarranted (and completely undesired) for simple pages with simple formatting such as these. At least I was able to do it manually.